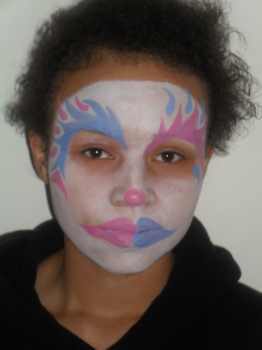 The coolest clown face painting ideas are here for you to look at also get some free face painting ideas. I'm sure I don't have to tell you how much FUN kids have with these kind of toddler activities. 1. 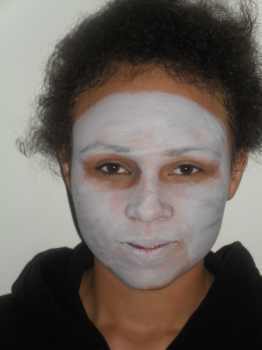 To start begin by painting the face in a white base as in the picture. Apply the paint with a sponge and evenly as possible. 2. 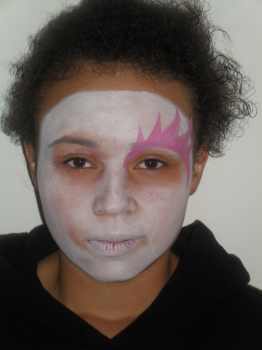 Next use pink paint to create a flame shape over the eyebrow and down the side of the eye. Then repeat for the other side of the face only this time do it in blue. Now add some small individual flames over the other bigger flames. But do them in the oppposite color. Finally paint the design around the mouth as in the picture. Then add a pink spot to the end of the nose. You can print of a clown face painting template here as a pdf. It saves having to print the whole of this webpage. If your looking for more face painting ideas then this video below shows you how to face paint a clown.